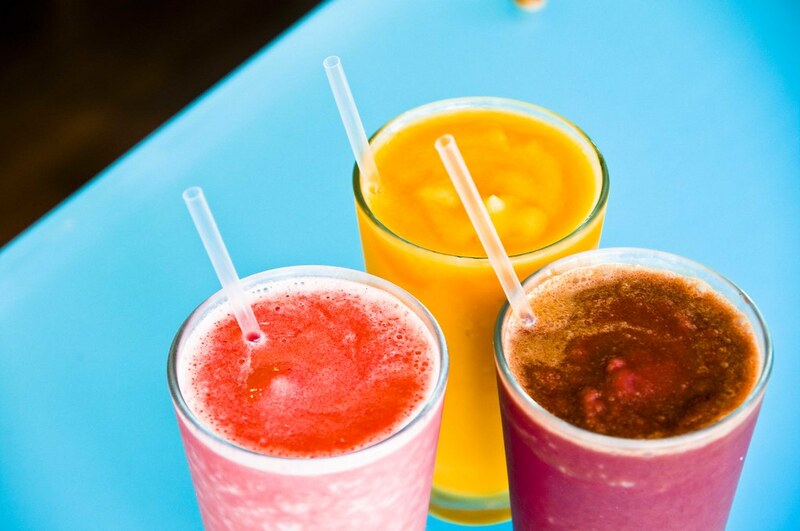 Drink the rainbow (or don't). After gaining a few pounds while visiting my boyfriend over holiday (Christmas dinner with two families will do that to you) I needed to find a way to get my health back on track. I initially considered the controversial juice cleanse but 1) I'm currently in Thailand and have access to more fresh produce than I could possibly ever eat 2) I don't like buying pre-made things, especially juice. After some research on a variety of fad diets, I decided a five day smoothie cleanse was the way to go. After all, when would I ever be able to buy so much fruit for so little, again? It's the same concept as a juice cleanse, but without having to spend money on the pretty packaging (plus a lot more fiber). The main concerns I had were: How would I feel at the end of these five days? Would I be left craving food or would I never question a "cleanse" again? Would I break-out like crazy or would my skin be clearer than ever? Would I actually lose weight or was I restricting myself for no reason? I had a pretty late start to my day, so I made a papaya and pineapple smoothie bowl topped with mango for lunch. It's so tasty. I start to think that this smoothie cleanse will be a (metaphorical) piece of cake, but then a few hours pass and the hunger starts to set in. I snack on some longan (dragon eye fruit) as a way to tide myself over until my next smoothie. I can't help but think about the pork buns I have sitting in my fridge. Around 5PM I blend up a few bananas and some chia seeds, this smoothie wound up really weighing me down. Uncomfortably so. The bananas seem to be the key to filling up on this cleanse. They don't stop me from having cravings though, I wind up going to sleep thinking about chicken rice. I wake up early, but it's for an unfortunate reason. The bloating from yesterday evening has taken a terrible turn. I blame the chia seeds. I "relieve" myself and peddle myself over to my blender and make a quick carrot cake smoothie bowl. A few hours pass and even though my stomach is making noises I don't feel hungry at all. Strange. Around noon I get hit with the sleepies, I can't tell if it's from waking up early or if it's from a lack of food. I take a nap which winds up lasting until 6PM. Whoops. The biggest difference between today and yesterday is how I managed to go the whole day without any crazy cravings (I was unconscious for most of the day though). I've hit the halfway point, woohoo! Start the day with a light lime and dragonfruit (aka: pitaya) smoothie. As an energy test I do a light workout: 30 minutes of yoga and 30 minutes of abwork and squats. I do better than expected, but not nearly as good as I should've. Immediately after the workout I make another smoothie (a banana one this time). I finally take a good look at my skin. One of my initial worries when I started the smoothie cleanse was that I'd wind up breaking out because of all the sugar, but in all honestly my skin looks great. I tend to look sorta pale and washed out, but I have a sort of glow right now? I make a mint smoothie loaded with ginger and turmeric, it doesn't taste very good, but boy, is it healthy. I hadn't been getting any greens these past few days and figured it was about time to fix that. One thing I've noticed while doing this smoothie cleanse is how damn often I go to the bathroom. I swear, I'm in and out of there at least a dozen times a day. At this point the cravings for "real" food have subsided, and I can't help but think that this diet is a — metaphorical — piece of cake. Waking up to both my last day in Thailand and my last day on the smoothie cleanse. I'll definitely miss all these fresh fruit once I'm in Australia. As a way to clean out my fridge I make one of my craziest smoothie combinations yet: orange, dragonfruit, carrot, ginger, papaya, and turmeric. Honestly, not bad. Due to all the stress of packing and doing last minute errands I wind up having a killer migraine, then I remember reading that bananas supposedly helped with headaches. I make a banana smoothie, and was sad to find that it didn't actually help. Bummer. This smoothie cleanse experiment was definitely interesting — and it did help me achieve my goal of shedding a few post-holiday pounds — BUT, I don't think I could live off of smoothies alone. I'm far too big a foodie. I will be adding more smoothies to my normal diet however, they helped make me "regular" (if y'know what I mean) and I did see improvements in both my body and skin. *I'm currently on break and therefore do not have classes. I take vitamins, drink 2 liters of water a day, and am a HUGE sleeper. I wouldn't recommend any type of cleanse to someone who does a lot of activity.